The annual Virginia Governor’s Cup Gala event to highlight the winning wines from the 2018 Governor’s Cup Wine Competition was held on 27 February 2018 at the Main Street Train Station in Richmond. 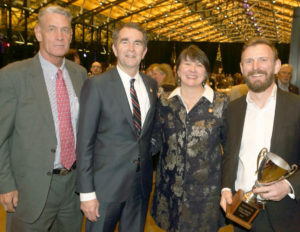 The cup was presented by Governor Ralph Northam to David King, owner, and Matthieu Finot, winemaker, for King Family Vineyards 2014 Meritage. 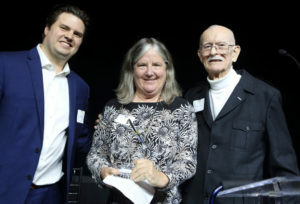 Two additional awards, given every year, were presented that evening: The Gordon Murchie Lifetime Achievement Award and the Person of the Year Award. Gordon Murchie, President Emeritus of the Atlantic Seaboard Wine Association and former Executive Director of the Virginia Wineries Association, presented the awards. 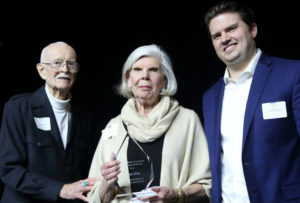 The Lifetime Achievement award was given to Lucie Morton and the Person of the Year awards was given posthumously to Frank Britt and received by his widow June Britt. Gordon Murchie was accompanied on the stand by the current Executive Director of the Virginia Wineries Association, Mr. Justin Rose of Rosemont of Virginia Winery and Virginia Secretary of Agriculture Ms. Bettina Ring.